← I Am Rich Because…. The sheer volume of crap we consume in front of screens is absolutely astonishing in the developed world, not to mention sad. It’s our biggest escape and procrastination tool, and yet everyone I’ve ever discussed this with agrees that they would love to cut back or cut the cable all together. First, you have to be willing to do this. After you’ve mastered that small mental hurdle, you can actually action it. Move the TV away from the couch! Put it in a closet in your spare bedroom, or in a room that you don’t like to spend time in. Or maybe just angle it away from the couch so it’s inconvenient to see. The point of this is to make watching television uncomfortable. Us humans will go so far as to not do something that we enjoy doing to avoid discomfort, so if you have no self control over your hand reaching for the remote, this might be the only thing that will prevent you from zoning out for hours on the couch. Just try it. If it’s truly unbearable, you can always bring it back. Breaking habits is one of the hardest things to do, especially when it comes to unhealthy addictions like smoking, sugar, and television. That’s why I’m not going to tell you to break the TV habit. I’m going to suggest that instead of trying to do that, you switch directions and try to build a habit during the time of your usual TV power hour. 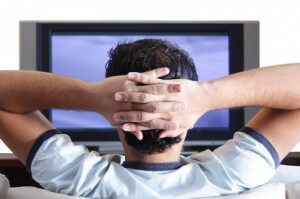 Say you usually sink into the couch cushions at 7:30 PM, after dinner, and watch for an hour. Think of something else you could do for a small portion of that hour – maybe fifteen minutes of laundry, reading, or working out – and start doing small amounts of that every single day. Increase the time as the weeks go on and eventually, you have built a new, better habit in place of your old one, instead of just cutting TV off cold turkey. Start small – don’t commit to working out for the entire hour that you’d normally be watching TV. Start with ten minutes, then move up very gradually. Remember, you’ve had this addiction for awhile so rushing the reforming of a habit is counterproductive. Cable. Or some variation of the paid service that makes the shows appear on your screen. You know what you can’t do if you don’t have it? Watch it. Surprise! If you are feeling bold and gutsy one day, cut the cable. Not literally – but call your cable company and let them know that you no longer want to receive the service. If that’s too radical for you, downgrade to the lowest package. You’ll wean yourself off of cable this way and eventually you can cut it out all together. These are all ways that you can actually work toward watching less television and doing more productive and healthy things with that time, and they make it easy to do just that. Do you have cable? If so, do you find your favorite shows are cutting into your productivity? We’ve been TV-free for over a year now. I never, ever, EVER thought I could do that. It feels weird at first, but then it becomes normal. Who knew? Congrats, Kay! It’s a huge step in the right direction. We scrapped the satellite roughly six months ago and decided to go with a Netflix account. Results in significant savings but more importantly a much higher quality of life not being glued to the TV constantly. It is by far one of the best decisions we have ever made. Oh, the quality of life is a huge thing! For us, it’s been amazing not having cable to hold us on the couch. TV is such a problem these days, from the commercials to the drama. I haven’t had cable for a few years now. I went a year without any TV, but used my DVD player to watch documentaries. My husband wanted to get the $20 receiver to get local channels and some sports. So, now that I have access to TV, I try to apply some of the strategies you list above like work out or clean if I’m going to have the TV on… with the exception of two shows per week that I actually sit and watch. I LOVE documentaries, and luckily we have Netflix which is great for some good documentaries. Documentarytube is also a good option. I’d never thought of actually selling the TV. That’s a good idea! Trying out new hobbies or physical activities is what I do to wean off TV. Plus I only have Netflix, no cable. Netflix is a must around here, for documentaries and the few shows we do watch. I cut the cable and ditched my TV when I moved. I live by myself so it’s not really a big deal. I find that I go to the bar more often to watch live sports, but I still save tons of money and time overall. One of the more beneficial choices I have made in my life.